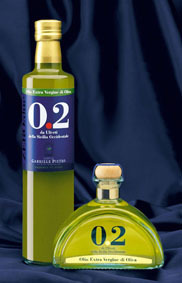 We produce our Extra Virgin Olive Oil in glass bottles of 0.25, 0.50 and 0.75 litre and metal can of 1 , 3 and 5 litres. For detailed information about each bottle, please click here to view the next page. 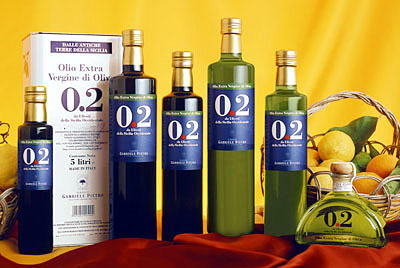 The quality of the oil is the same for all the packaging arrangements. 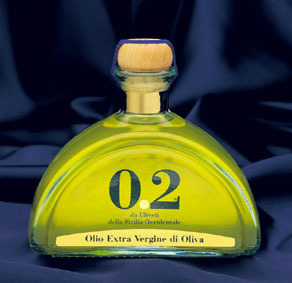 We produce only one quality of Extra Virgin Olive Oil exclusively from West Sicily olive groves and directly controlled on each phase of cultivation, ripening and production: the "0.2" Extra Virgin Olive Oil.